X-kit Achieve! 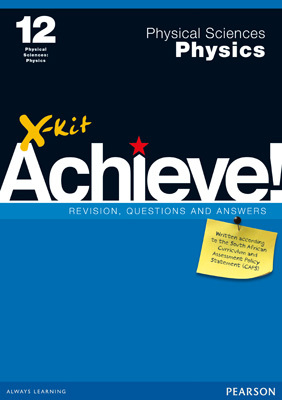 Grade 12 Physical Sciences: Physics Study Guide | X-Kit Achieve! Understand and master Physical Sciences with X-kit Achieve! Physics Study Guides. Graded exercises and worked solutions help learners assess and improve their Physics skills. Carefully structured exercises require them to practise the basics, apply their skills and solve problems. Clear, step-by-step explanations, annotated worked examples and explanatory notes make understanding and revising Physics easy. Topic tests and practice exam papers with memos prepare learners for tests and exams. Copyright © 2000-2019 by Pearson.